Looking for a reliable 7/8 seat family car SUV that rides well. I like the Mazda CX9 but realize the Highlander and Pilot are generally more reliable. 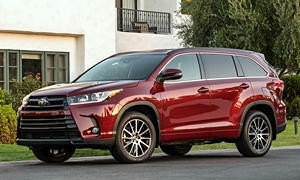 (Test drove Highlander and found it lacking in any "pep.") Probably go with a 2018 to get new safety features. Any thoughts on the CX9 or reasons I should stay away? Or suggestions on something else? The CX-9 drives great, but reliability hasn't been that good. I would only consider it if you really want a big SUV that handles well and has a very nice interior that belongs in a $60k SUV. If I was looking for a midsized crossover, this would be the one I would buy. However, there are other more reliable and practical options. Infotainment is the main problem area. CarPlay is not available on the Mazda. The Highlander has the most HP of the three, but it doesn't feel like it. It is the most reliable midsized crossover and has every safety feature standard on every trim. It has the most practical interior in my opinion. It handles better than the Pilot, but still isn't that nimble. Resale value is really good, about the same as the Pilot. I would put the Highlander in your top 3. CarPlay isn't available on the Highlander either. I like everything about the Pilot except it has an unreliable and rough 9 speed transmission in the top two trims and a buggy infotainment system. It is one of the faster SUVs in the class and the interior is practical and more luxurious than the Highlander. It has CarPlay and Android Auto. 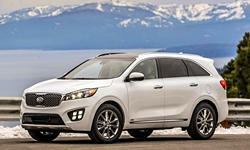 I suggest you test drive the Kia Sorento. It rides very well, is reliable, has a nice interior, and has a lot of standard safety features. It has CarPlay and Android Auto. I was impressed with this car when I drove it and auto journalists like it, too. It has a 10 yr/100k mile powertrain warranty. Resale value is less than average. It is on the smaller side, so, as with all of these SUVs, try to fit your kids/adults in the 3rd row before buying. Some advice:Minivans are SO much better at fitting things in the trunk. 100% of the time they have a larger and easier-to-access 3rd row of seats compared to SUVs. They get better gas mileage and handle just as well or better than SUVs (depending on which one). If you are looking for an AWD minivan, the Sienna is the only one. SUV prices are inflated right now because everyone wants one (gas prices are low-ish). 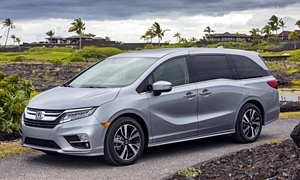 Dealers will be more willing to discount minivans. Minivans are built in with more family-friendly features. You miss out on a lot when going with an SUV. The only benefit of an SUV is people like the exterior look of them more. SUVs are just impractical minivans underneath the sheetmetal. CX-9 is below average for the class on many metrics including cargo hauling, fuel economy, handling, acceleration but costs the same or more. The CX-9 is about the smallest 3-row crossover you can buy with the 3rd row kids only. The largest Traverse/Enclave can swallow a CX-9 cargo between the 1st and 3rd rows. It should perform really considering it size, but is below the 3-row segment average. "....This is a first test, so we've belabored the numbers here for you, and we can tell you they're average for the segment?below average for V-6s in the segment. But nobody drag-races or autocrosses a three-row CUV. And nearly every editor who has driven the two new Mazda CX-9s has noted that once you leave the proving ground environs and just experience the vehicles in the real world, this little engine feels amply energetic. Many said it felt like a higher-revving diesel. There is a caveat, however. Our drive was in the high desert above Los Angeles in August, with ambient temperatures in the 100s. Under these conditions, the air conditioning struggled mightily to cool the cabin and the engine appeared to suffer some heat stroke of its own, pulling boost after long periods of heavy use on the handling track. (No other vehicles tested in the same conditions on those same days suffered any such maladies. )...if our Real MPG data is to believed (as we think it is). We somehow recorded 18.0/25.0/20.6 mpg for the front-drive CX-9, which inexplicably undercuts the heavier Signature AWD model's 18.7/25.8/21.3 mpg. This time there's no blaming the tires. Perhaps more disturbing is the fact that there's a larger, roomier, quicker, V-6-powered three-row CUV that out-performs both Mazdas in our Real MPG testing." New 2018 Chevrolet Traverse RS for sale at Feldman Chevrolet of Lansing in Lansing, MI for $37,030. View now on Cars.com. Despite what Motor Trend said there, they also said, "Why were we thrashing it hard on a handling track?another thing three-row CUVers never do? Because this chassis fairly begs for a jolly good rogering. The steering was almost universally hailed as among the best in this class and possibly a few adjacent classes in terms of road feel and feedback"
Car and Driver In-Depth Review- "Three-row crossovers are great for hauling kids and cargo, but they aren't always pleasing to drive. The Mazda CX-9 is a rare example of a crossover that still blends a great deal of driving fun in with all the utility thanks to a well-sorted chassis and communicative steering. Also, its beautifully designed exterior looks the part, with a long hood, steeply raked windshield, and fastback rear end. Inside is an equally lovely cabin, dressed in nearly class-above materials and features. We'd be lying if we told you all this goodness came without compromises: Cargo capacity and third-row passenger space are among the lowest in the segment. But those compromises are small, and they weren't enough to sway us from naming it to our 10Best Trucks and SUVs list for 2017. Car and Driver Long Term Test- "The whole of our 40,000-mile test was equally fairy-tale-like. For 16 months, we never grew tired of the CX-9. Its smart engineering and superior value acted as a salve to the frequent suffering of those middle-aged family men on staff who watch their younger and less attached coworkers drive off weekend after weekend behind the wheels of the sportiest cars in our stable. As deputy editor and parent Daniel Pund succinctly put it, "The Mazda CX-9 is really the only mainstream three-row SUV I can actually see myself buying and driving."" 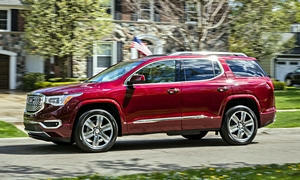 Motor Trend Comparison- GMC Acadia came in last, Highlander came in second, CX-9 came in first. They all said the CX-9 is not as spacious as its competition, but drives much better than the competition. It handles because it is one of the snallest. Probably the size of a Dodge Journey 3-row. Journey GT does the figure -8 In 25.5 or 1s faster than Signature and 2s faster than the Touring. On 1s at 40 mph average figure eight speed is 58 feet. And 2s is an eternity and smokes the CX-9 even at 4,400 lbs. Thank you very much for the responses! Extremely helpful with a lot of good insights to consider. If you have the luxury of waiting a month or two and don't fear a 1st year model, you might consider the all new Subaru Ascent. It seems to have all those who test drove it in the Subaru auto journalists event all ga ga with many claiming it is the 8 to beat. Like other Subies in isn't the best by every measure but it appears to be an extremely complete, competent package. Should be available at most dealers within the next month. Subaru initial quality has not been that great. They are not even mention in 2017 J.D. Power Initial Quality study. Good to know and somehow that's not all that surprising. I hope my Forester holds up. At the end of the day, the Highlander is probably my best bet as it looks like the most reliable, and I like its aesthetics. Unfortunately,it wasn't too fun to drive. I guess i'll save that for later in life when i don't have to prioritize the family vehicle aspect as much. Actually, one more question repurchasing - for my last couple cars, I went to TrueCar.com to get a baseline price and then shopped around at several dealers leveraging that. I will also look to get a 2018 as I am going to purchase in late September so hopefully they will be looking to clear those out. Any other advice on getting a good a deal? If you have a Costco membership, I would look into buying a car through their auto program. My wife tried it 15 years ago when buying her minivan and saved $3k on the car, which was selling so well that it was on backorder. Plus, they put added the towing package for free. I've also heard TrueCar is good, though I've never tried it. Only certain dealers partner with TrueCar and Costco. Buy on a Monday as that is when salespeople are struggling to find a buyer. Rainy days are also good as no one else will be buying a car. Toyota usually has a Labor Day clearance event so that would be a perfect time. I think the biggest mistake people make when buying a car is that they don't want to travel far to a dealer that potentially can sell them an identical car for thousands cheaper. Most of the new car dealers in my city are terrible scammers and have poor reviews, yet people still want to buy from them "to support their business." I call or email 5 dealers and tell them the specific trim and packages I want with my car. If one dealer can't provide a good deal, tell them the other dealer has a better price so you'll use the other dealer. This will pressure the dealer you are talking to to lower the price. How to get best price? Get your Costco price as a bargaining chip - this should be the most you will pay for the car. Go online looking for affiliations with business, professional, or recreational groups that can get you a discount for being a member. For example, I joined biking.com for $24 and got $500 off my VW Golf after the dealer's best price. Then, always contact potential dealers via email using internet sales person. Because you are using the internet, they know that you are savvy & have a pretty good idea what the invoice for a particular vehicle is and also have a good idea of the True Market Value. Thus they are less likely to try play games of fleece you -- at least that has been my experience with my last 3 new car purchases. Get the out the door price (actual vehicle cost, all taxes, fees, license, registration, processing, full tank of gas ... Don't buy based internet quoted price only. Read google & yelp reviews for the last 6 months on potential dealers. That will give you a pretty good idea of their overall integrity and the likelihood that they are shooting straight with you. Unfortunately you will still have to go thru the finance person aka "Da Closer". Their job is to add as much dealer profit to the sale as possible so they will try to upsell you things such as extended warranty, interior & exterior protection packages, gold plated license plate frame, muffler polish... Know what you want and politely but firmly decline all else. If you are interested in an extended warranty, realize that there is a lot of profit in those & that you can often find them discounted from some dealers. Also, you can wait to purchase the extended warranty as long as you get it prior to the basic warrantly running out (variable but typically 36,000 miles or 3 yrs). Happy hunting and please let us know how your deal went down. The Ascent is brand new and just hitting the lots. It there was one that was $1,000 off MSRP. Otherwise pay full price to be the first one. Dan had some great advice. Also, when talking to the salesperson, act like you are smart and know what you are talking about. If you don't, they sometimes take advantage of you. One of the benefits of driving a Toyota is the legendary reliability, so I suggest you save money by not getting the extended warranty. My parents fell for it when they bought a 2017 Avalon and I think it was $2000. Salespeople are usually pushy, though I haven't had a pushy salesperson with the last three cars I've bought. As Lectrofuel says: "when talking to the salesperson, act like you are smart and know what you are talking about." Yessire! 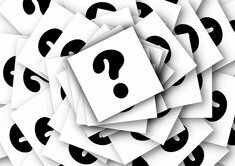 Best to know exactly what you want including options, specs...in detail before you contact a salesperson. My experience is that if you research your model well, read a few reviews on it and know the current market value (using True Market Value or Edmunds) you will be well prepared. And you likely will know as much or more than the salesperson althought there are a few very exceptionally well versed sales people. Chombs: Since it will be a couple of months till you purchase and you have some interest in the new Subie Ascent here are a couple of ways to get a break on it. 1. You already own Subie; call Subaru of America & tell them you are in the market for a new car with the Ascent on your short list. Ask for Subuaru loyalty discount. Most people who do this can get a $500 voucher direct from SOA. Apparently it is somewhat discretionary so if you don't succeed the 1st time, try again later. The cost to play varies but if you are a member of one of these organizations, you can get a VIP discount which amounts to a 2% discount off the invoice. For example, give a $500 donation to the ASPCA & you get the VIP discount. The Traverse looks sharp and it's big; however, my concern there is reliability. It doesn't seem to get the marks Toyota and Honda have - but i'm not sure where it exactly sits. I like the Acadia and Durango as well, but same concerns. The Sorento and Sante Fe have great warranties and seem to be decently reliable, with the warranties helping out where lacking. The 2017 and earlier are rated best 3-row crossover in the in Consumer Reports, and e the Toyota Sequoia. CR always down rates new models the 2018 redesign of the Traverse. It if any indicators of reliability of the newly redesigned Equinox the Traverse will be No. 1 again. What duration will you need the extra seating? 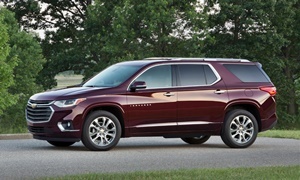 Consumer Reports gave the Traverse a reliability score of 2/5, which is below average. The Traverse is a good crossover, though not reliability-wise. It is the first model year of the Traverse, so I would wait a year for the bugs to be fixed. Also, the Traverse is rated 69/100 overall. It has a great road test score, 96/100, but when taking into account reliability and how accessible the active safety features are, the overall score is lowered. The Highlander has an overall score of 85/100, which is much higher than any other midsize SUV. 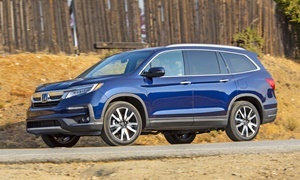 The Traverse is technically a midsized SUV (a big one), so when compared to them with their overall scores it places 8th out of all the midsizers, tied with the Nissan Pathfinder. They have a pretty good rating system, and I agree with most of their ratings. The Acadia is even worse than the Traverse. It has a 1/5 reliability score. It also just isn't a great crossover compared to the Traverse. I would avoid the Durango, as the reliability is hit or miss and it is an FCA product. The Sorento is one of my favorite midsize SUVs. It places 2nd in CR's overall scores for midsize SUVs (lost to the Highlander). It is a smaller SUV, like the Acadia. Its reliability is average. The Santa Fe is a little outdated, but you can get a good deal on one. They have been pretty reliable. Their powertrain warranties are very good. The first generation Traverse (2009-2012) has a reliability rating of "Poor" for the first 4 years, in line with TrueDelta's scores. It is average for the next 5 years. Lectrofuel, that is predicted reliability of the new 2018 Traverse that came out last October. No stats on it as it is too new. But the new 2018 Equnox has been out for 12 months and has a very solid new model launch so expect similarly for the Traverse. 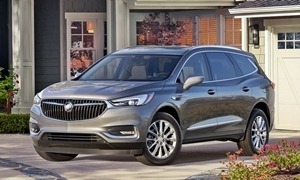 The 2016 era Traverse, Acadia, and Enclave were basically all the same and an older architecture that were very good overall and the largest crossover in the segment . Their combined sales of the Lambda platform was was also segment t best at the time. For 2017 the Acadia went small and shares Cadillac XT5 but still offer 3-row. We drove and thought was too loud compared to our 2015 Terrain. The Enclave and Traverse co tinged to share their newly redesigned platforms for 2018 and continue to be the largest in the class. The Toyota stuff is old and inefficient with fuel economy in the teens. Check out cars.com/Motorweek comparisons of 3-rows and the Toyota is never at the top as they are too old and get poorest fuel economy. CR won't have a data-based reliability score for the 2018 Traverse until October. Anything they provide now is a prediction based on the previous generation and/or other GM models. As of now the boss (aka wife) is leaning towards the Pilot so we'll see how that plays out. Another option I am giving some thought to is taking over someone else's lease via swapalease.com or one of those sites. Maybe find something for 12 or so months so I can give the Ascent a year to work out its kinks and the evaluate everything again. We'll see what we think about that plan after it hits lots and we get to test drive. I daily drive a 2017 Honda Pilot with the 9 speed transmission and all the bells and whistles and have had absolutely no issues with it. It has the pep when needed and auto start-stop in bad traffic. The 2019 should be out in mid-July so there may be deals to be had on the 2018 as well. Feel free to email me back if you have any questions. The 2019 will have an "updated 9-speed," so it may be more reliable. I know that not everyone has problems with the Pilot's 9 speed, but almost everyone says it's shifts are unrefined and jolty. I don't think many people would mention that it had problems if it did actually shift well. So the verdict is in and the new vehicle is going to be the: Ascent. It checks all the boxes: good space for this segment, a nice ride (comparable to the CX9), good technology, and a nice look (certainly not fancy and while similar to the Forester and Outback, I think the size gives it a better look). I also learned that i can extend my currnt lease with Honda for up to 1 year. Only extra cost is additional state tax, which is $12/month in NJ. Any additional thoughts to round out this equation are welcome. Otherwise, thanks for all the feedback, it's been helpful.